SXSW has just kicked off, and already the big stories are starting to break. We'll be here for the next few days covering the major headlines and speaking to the Honky Tonk Heroes of wearable tech. But what of the week that's already been - the week that will forever be known as the week Conor went on a date with translation earbuds. I won't spoil the surprise, but you definitely need to go read about it. It was an interesting week for VR too. Husain took a look at how actors like Nic Cage and John Travolta are learning to act in VR, while getting a glimpse at what might be the most bizarre Travolta film to date - and no I'm not talking about the upcoming Fred Durst movie. Also be sure to check out our full Tag Heuer Connected Modular 41 review, which dropped this week. "If you were in the market for a luxury smartwatch and weren't quite won over by the first two Tag Heuer Connected watches, Tag has now taken care of all possible concerns in its own poised, chic game of Whac-A-Mole," says Sophie. Ok, let's take a whistle-stop tour through the big stories of the week. It was a bad week for Oculus PR machine as headsets around the world just... stopped working. The culprit, of all things, was an expired certificate, and while Oculus did get things up and running again, headsets were bricked for almost an entire day. It's one thing to take down a portion of users with, say, a botched update, but another thing entirely to wipe out everyone. We assume someone at Oculus VR got a good telling off this week. If you were affected, hopefully it didn't ruin your day too badly - after all, actual reality's not so bad, you should check it once in a while. But one day the virtual universe is going to be far superior to the one we're living in, and if this happens then, needless to say we'll be penning Zuck a strongly worded letter. Not long ago we brought you details and pictures of Fitbit's next smartwatch, and this week we learned its name. According to serial leaker Evan Blass, the watch is called the Fitbit Versa, confirming that it won't be called the Blaze 2, as we'd suspected might be the case. There are still a few things we don't know, however. We still don't know if it will have onboard music storage, and we don't know if Fitbit is introducing any additional software features beyond what we've reported on. We suspect it won't be long before Fitbit reveals all. 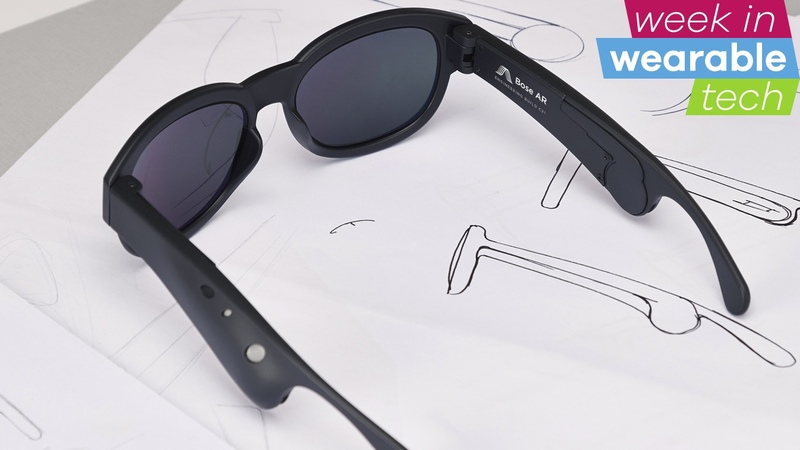 Just when we thought it was all over, Bose finished off the week with a last-minute banger, dropping a pair of prototype AR smartglasses and announcing plans for an entire platform for others to build wearables on. But Bose is drawing on its strengths here by focusing on audio, not actually showing anything visual on the glasses. It's essentially a hearable, augmenting the world around you with sound. Rather than displaying information, it'll tell you something about what you're looking at, whether that's information about a restaurant or recreating sounds at a historical landmark. There's a lot of potential here, and it really all comes down to the AI. The glasses you see above, which we'll be trying on at SXSW, aren't going on sale. Or at least, not yet. They're more of a reference design to show off the potential of the platform. We've seen similar applications in glasses, including Vue's, which we should be shipping very soon. Vue's don't augment the world in the same way, but they share a similar design aesthetic: simply, glasses we'd want to wear. Even the Vuzix Blade, one of the better looking pairs of smartglasses to use visual AR, is still not quite as svelte as a pair of everyday specs. Going the audio route, paired with a smartphone, means fewer components in the frames, and a better design as a result.